[FTC Disclaimer] This is not a sponsored post; however, the Amazon links that I give are Amazon Affiliate links. We were shopping for supplies for a project and found some Buffalo Chicken Sausages at Fresh Market. We didn't need the sausages for the project, but I couldn't just pass them up once I saw them, right? When we were brainstorming how to use the sausage, I thought of the Buffalo Mac and Cheese that we used to get at Rafferty's (before they closed our local one....boooo). So we made mac and cheese with the Buffalo chicken sausage instead of fried Buffalo chicken. Of course, we made ours over live fire on a kamado grill - a Big Green Egg to be specific. But you could do this inside as well. Make the sausage and sauce on the stove top and then roast the mac and cheese in the oven. I love this small Lodge cast iron skillet because it is grill safe and the wok-like sloped walls make it easy to toss and flip food while cooking. I bought one for my mom a few Christmases ago and was so envious I purchased one for myself! For the indirect set up on a kamado grill, I used an Adjustable Rig (Ceramic Grill Store) with a spirder rig/stone for my heat diffuser. 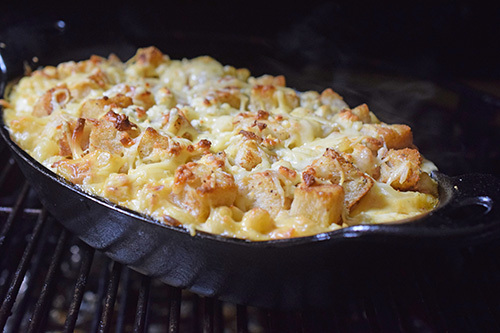 This let me get the cast iron casserole dish up high in the kamado grill so that the heat reflecting off of the dome lid evenly browns the top of the mac and cheese. If you are using a regular plate setter, you could still accomplish this by using a raised grid or even stacking the casserole on top of a fire-brick. You can use whatever for a garnish. Since it was the Buffalo wing flavor profile, I chopped up some fresh celery leaves for the garnish but you could use green onion, parsley or something else. For our cheeses, we used 1 cup of smoked gouda, 1/2 cup of Cabot Legend Reserve White Cheddar, and 1/2 cup of smoked Gruyere. For mac and cheese, I like to use a blend that has melty cheeses (Gouda, Fontina, Gruyere, etc.) and then something flavorful, usually a cheddar of some type. Preheat your grill. Set up your grill for direct heat and preheat to 400°f (medium-high). Cook the pasta. Cook the pasta according to package directions and when draining, reserve 1 cup of the pasta water. Brown the sausage. 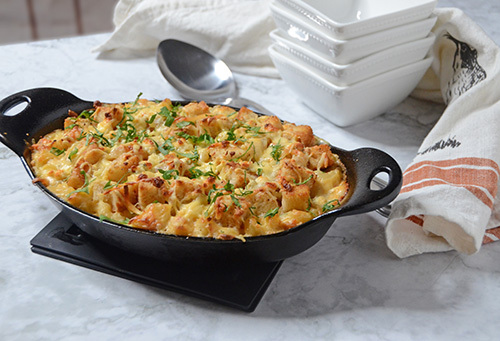 Place a cast iron skillet over medium-high heat. Remove the sausage from the casing and brown in the skillet, about 8 minutes. Remove sausage from the skillet, reserving the fat. Make the sauce. Add butter to the skillet and whisk in the flour until combined in a light roux, about 1-2 minutes of constant whisking. Slowly add in the whole milk and then the cream, still whisking continuously. It will start to seize up at first, but as you keep whisking and adding liquid, it will become a creamy base. Whisk in the beef rub and Buffalo Wing Sauce. Add 2 cups of the cheese in small batches, waiting for each batch to melt before adding the next. Put the mac and cheese together. Add the pasta and sausage to the sauce, stirring to coat everything. If the sauce is too thick, add some of the reserved pasta water to thin it out a little. Pour into a greased, grill-safe casserole dish. 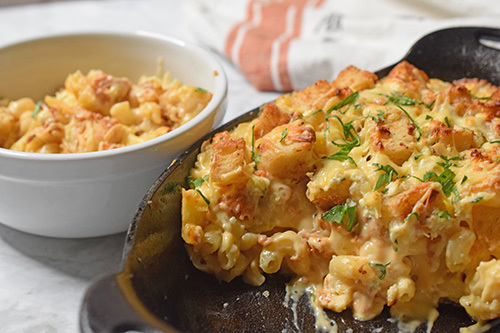 Press the croutons down into the mac and cheese. Crumble the blue cheese over the top. Fire roast the mac and cheese. Switch your grill to an indirect heat seat up (see Notes/Substitutions) and keep the heat at 400°f. 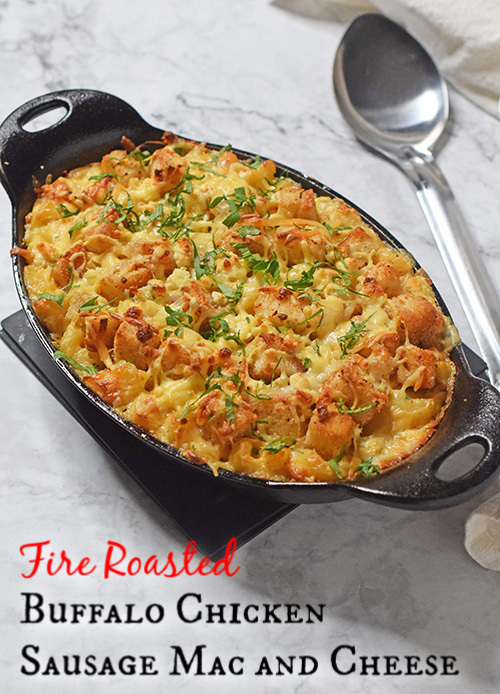 Fire roast the mac and cheese until the top is toasted and the cheese sauce is bubbling up - about 20-25 minutes. Add the remaining 1/2 cup of shredded cheese at about 10 minutes from the end, just long enough to melt. Buffalo chicken pasta - We found ours at the Fresh Market meat counter. 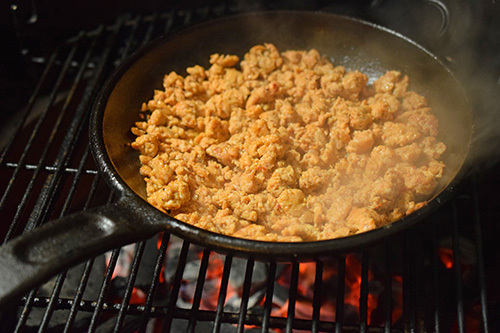 You can substitute regular chicken sausage and up the Franks by a tablespoon or so. cavitappi pasta - You can use corkscrew pasta, elbows, penne, or just about any pasta small that will allow the sauce to cling to it. Indirect heat - This just means that the food is not directly above the heat source. For a kamado grill (Big Green Egg, Kamado Joe, Grilla Kong), this means putting in a plate setter/ConvEGGtor/heat diffuser. For a kettle grill (Weber, Char-Broil Kettleman), bank the coals to the side and put the food on the other side with the lid closed. For a gas grill, leave at least 1 burner off and put the food over that burner with the lid closed.